There are two types of mobile carriers in the United States: national carriers and MVNOs. National carriers like Verizon, AT&T, Sprint, and T-Mobile command higher prices for faster data speeds and benefits like better customer service, free Amazon Prime, or Netflix. MVNO, or Mobile Virtual Network Operators, are smaller carriers that lease tower space from the big four. You can often save a ton of money with these plans — but you may run into slower data speeds or less desirable customer service. 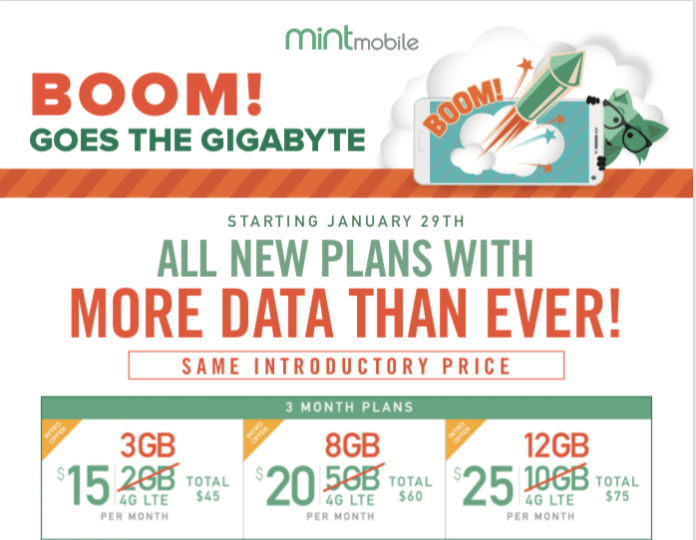 One of the best MVNO’s out there is Mint Mobile. We’ve been a fan of the company for a long time primarily because of its excellent pricing structure. In short, you can buy in bulk and pay more up front to lower your monthly cost. While the company doesn’t offer unlimited data like bigger carriers, it does offer some pretty sizable data buckets and now, they’re getting even better. As you can see, you’re getting a ton for your money, especially if you’re buying the 12-month plan. Sure, it can be scary to be locked into a new carrier for a year but that’s why Mint Mobile offers the excellent introductory rates. Try it out for a few months and see how you like it. If it isn’t for you, move onto another carrier. If you want to find out more about Mint Mobile, check out our article here which has a lot more information. If you’d like to sign up for the service, you can find their site here.